Roller Hockey Insurance for youth and adult teams includes General Liability, Directors & Officers Liability, Accident, Crime and Equipment. Roller hockey insurance is important for leagues, teams and players given the many different types of injuries that can occur while playing the game. Roller hockey is a full contact sport played on a dry surface. It is included in the four categories of sports with the most injuries to bones and muscles: basketball, cycling, football and roller sports. Speed and the hard playing surface may account in part for the high rate of such injuries. Every roller hockey organization should have a properly-worded liability waiver/release that is distributed to players and parents for signature every year before practices and play begin. The waiver should specifically mention the types of risk that are assumed. Please see “Are Waiver/Releases Worth the Paper on Which They’re Written?” where we offer advice on the pitfalls to avoid when drafting a waiver/release of liability. Protective gear is the best defense against injuries. A helmet (w/cage for certain age groups), elbow pads, protective gloves, athletic cup, and shin are the minimum protection each player should wear. Goalies also use a neck guard, chest/arm protector, blocker, catch glove, and leg pads. Wrist guards can reduce 87% of wrist injuries, elbow pads can decrease the number of elbow injuries by 82%, and knee pads the number of knee injuries by 32%. Physical collisions are frequent in roller hockey, and coaches and/or administrators can be held liable if protective gear isn’t available or used appropriately. 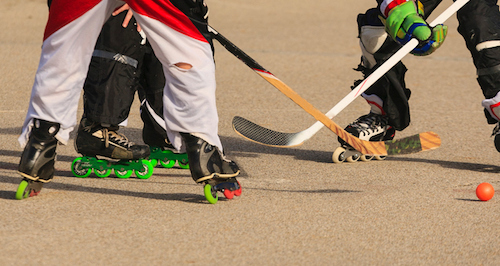 Roller hockey insurance provides protection against lawsuits that may arise out of injuries of this nature. Wrist injuries are the most frequently seen in roller sports, making up 37% of all injuries, two thirds of which are fractures. Knee sprains and ligament injuries make up nearly half of all injuries to the lower extremities in roller sports. Muscle strains result from poor posture and overuse. Lower-back injuries occur frequently as a result of the bent-forward skating posture of skating and frequent backward hyperextension. Shoulder injuries commonly seen in roller hockey are shoulder separations and broken collarbones resulting from direct contact with another player, the rink boards, or the ground. Unfortunately, occasional fights break out on the rink, typically when a player retaliates for a hard or perceived “dirty” hit. Fighting should not be tolerated and most local recreation leagues suspend or ban players who engage in such behavior.